It would be great if a component could provide an array of data that is plotted as a graph in the frontend. Weather forecast. 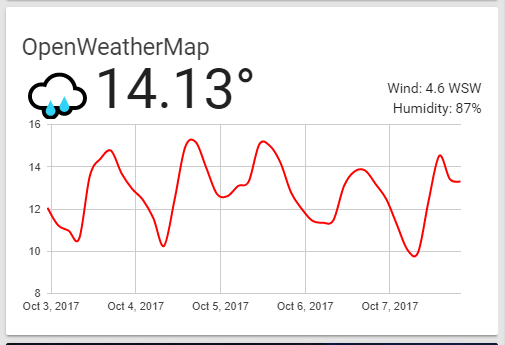 A backend component could provide an array with expected future temperature (rain, wind or something else), and this should be shown as a graph in the frontend. Electricity price. 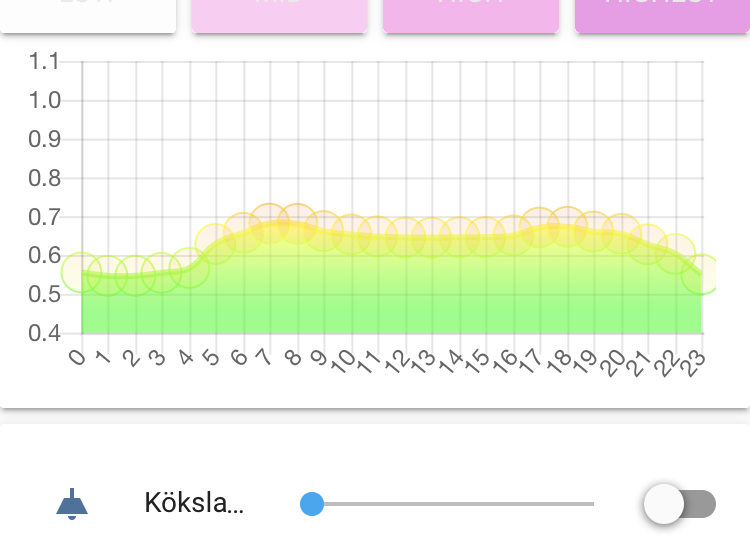 In the Tibber sensor (https://github.com/home-assistant/home-assistant/pull/9661 ) the electricity price is available for the next days, so the backend component could provide an array with this data. @andrey : Is this something you could be interesting to do? I know you have done a lot of great work with the frontend. I have not done much development of frontend, but could help with the backend code. In some cases, isn’t this already in place, but not in the default display. The history component populates a graph that can be viewed by clicking on a component. Can this just be pulled into the default view or are you looking for something else? No, what you’re referring is plotting available only to the recorder component. What daniel means is a “framework”, so that other modules from the backend can expose data, that is graphed in the frontend. However, this data is in no way related to recorded events and values, it could very well be about future values (e.g. weather forecast). I think this can be useful indeed! But I think the graph should be part of the more-info card as the history plot. FYI, the weather platform already has this functionality, OpenWeatherMaps certainly (I added it myself), not sure about the others. Plotting graphs is added in 0.55 with the History Graph component. Instructions for setting up History Graph. I understood from this thread that I can plot future data on graph using history graph, like weather forecast or electricity price. But I could not achieve this. OpenWeatherMap shows only recorded data, and not forecast on graph (forecast is shown below using lots of rows). 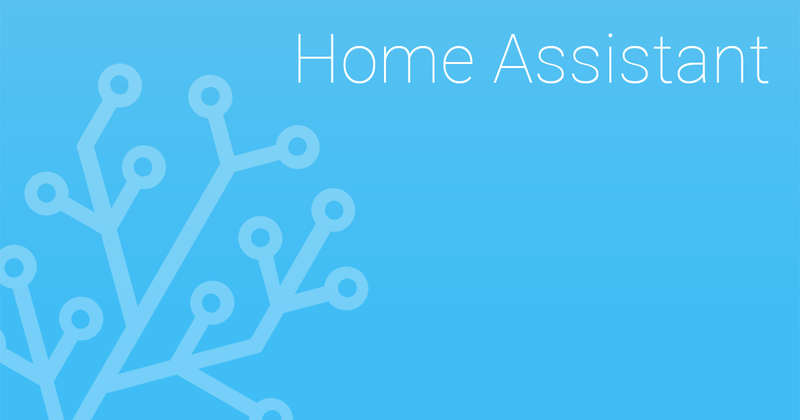 Is there any component which shows future data on graph in Home Assistant ? Just wanted to share that I am currently doing a hack where I have a html in my www folder which I view using an iframe-card. it works well on my wall tablet, but it’s not very elegant elsewhere, and it seems like it affect load time on older devices. I have it displayed on my kitchen tablet, and I haven’t opened the tibber app since basically. I have a full screen view version as well, but it’s a bit redundant actually. Ideally I would want to make this into a lovelace card, but ultimately lacking the knowhow. Would love some help if there are any takers. (A second dark line appears once the price for the upcoming day is avaiable). Below is the html shown in the iframe card. So essentially it’s a JSON query to the API using a Bearer token (I pasted one of their demo tokens above so hide my own). I posted here as well, in case it was possible to integrate with the lovelave mini graph card.